In past talkcasts we discussed upcoming shows and new offerings from the networks. 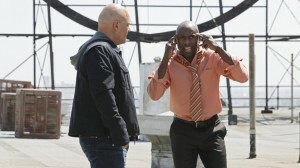 Recently, ABC offered a sneak preview of its Tuesday night show, No Ordinary Family. In the land of no spoilers, I am gonna give you the 411. It stars Michael Chiklis, Julie Benz, Jimmy Bennett and Kay Panabaker as the ‘Ordinary” family. As with many Super-Heroes-from-the-masses stories, this family is doused in some magic Amazonian waters as a result of a plane crash. In the pilot we gets to see how this all happens and a liberal dose of the structure of this family as well as the structure of the show. If the structure stays, it’s told in third person from the vantage point of marriage counseling. Gotta say, this is a nice twist. With Chiklis and Benz as the somewhat dislocated parents and Bennett and Panabaker as the angst ridden teens trying to survive school, it makes a believable unit. This hour drama has some very good possibilities; smart acting, a better than average cast, decent writing and a good starting-off time slot. This is Dome sayin: Good luck, I think I will be watching this one.